How many of each rod did you use? How many rods in all? Use Cuisenaire Rods to recreate each design. This is a great activity to work on fine motor, spatial awareness, and critical thinking. Full page mats - Place the rods right on the mats. Laminate the mats for durability. This set comes with 10 different pictures. Pictures include: cactus, chips & salsa, guitar, hot pepper, hot sauce, maraca, mariachi player, mustache, pinata, and sombrero. 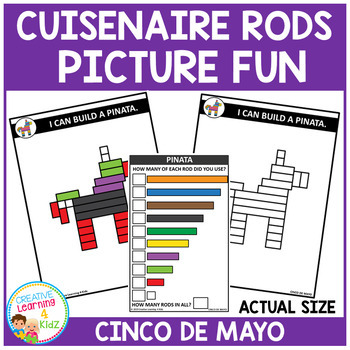 Please note - The pictures you are building with the Cuisenaire Rods will not be realistic colors. For example an apple will not be red, it will be made up of several different colors. The purchaser is granted permission to download and print this item for non-commercial individual or single classroom use only. This file and the finished product is not to be shared or resold.